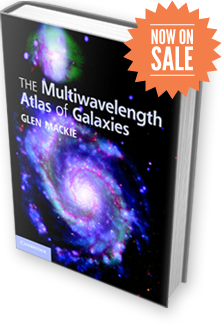 I received a Ph.D. (The Stellar Content of Central Dominant Galaxies) in Astronomy and Astrophysics from the Australian National University (astronomers just usually refer to Mt. Stromlo) in 1990. I then swam away from Australia and came ashore in the USA (University of Wisconsin-Madison) where I was a 'Badger Fellow' post-doc working for the WF/PC instrument team on Hubble Space Telescope. I left the mid-west with my new ice hockey stick slung over my shoulder and skated into Harvard-Smithsonian Center for Astrophysics in Cambridge, MA. After the Bruins de-listed me for not fighting enough I ventured back to the southern hemisphere and was blown into Wellington, New Zealand (Carter Observatory and Victoria University of Wellington). 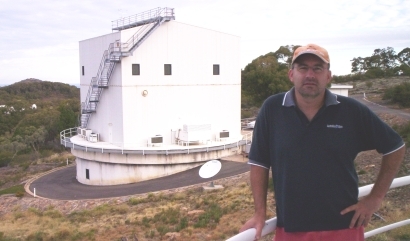 In 2001 I crossed the Tasman to the west island and began astronomising at the newly formed Centre for Astrophysics & Supercomputing (CAS), Swinburne University of Technology. I began an astronomy career after deciding that working the midnight-to-dawn shift at the University of Melbourne physics basement accelerator lab. was not for me! Since then some of my most wondrous times have been at a telescope and observing dark night skies (Mauna Kea, Cerro Tololo, Kitt Peak, Siding Spring) from dusk 'til dawn! I was lucky enough to be a grad. student at Mt. Stromlo and rub shoulders and minds with some great people there. At Swinburne we have a relatively young department, but also one of the fastest growing in Australia, that has already attracted a world class group of staff, post-docs and PhD students. It is a privilege to teach, research, lecture in and promote astronomy.